Whilst global leaders have been discussing climate action for decades, the fossil fuel industry has been allowed to continue to compromise the livelihoods and environments in localities as well as contributing to the unprecedented and increasingly catastrophic changes we are seeing in our global climate. On every continent there is an increasing frequency and intensity of resistance movements against fossil fuel projects. These interwoven spaces of resistance are Blockadia. Originating from movements such as the Ogoni People against Shell in the Niger Delta since the 1990s and the Yasuni initiative in Ecuador to leave the oil in the soil, local people and activists are demanding we keep fossil fuels in the ground. Today there are diverse and widespread resistances such as the Ende Gelände mass civil disobedience in Germany; the indigenous-led Standing Rock camp against the Dakota Access Pipeline; the movement in Kenya to “deCOALanize”; and, amongst many others, the campaigns #BreakFree and #SaveTheArctic. Naomi Klein popularized the term Blockadia in the book "This Changes Everything" describing the “roving transnational conflict zone [...] where ‘regular’ people are stepping in where our leaders are failing” along the whole fossil fuel chain, from extraction to transportation to combustion. These struggles are not only against the local impacts of such projects, but also against their impacts on the climate. What the Blockadia Map aims to do is bring together incidences of Blockadia-style resistances against fossil fuels along the whole chain. Included in the Blockadia Map are cases from the Environmental Justice Atlas which involve people defending their land, livelihoods and climate from fossil fuel projects, through direct action such as blockades, occupations and street protests. By bringing together inspiring case studies, the diversity of the movements can be celebrated whilst the connectivity between them can be strengthened and the real ‘glocal’ threats of fossil fuel extractivism can be better understood. The local causes of resistance vary case by case, but many include the violation of human rights, contamination of water, land dispossession, loss of livelihoods, poor working conditions, biodiversity loss, cultural loss, severe health impacts and inadequate compensation. 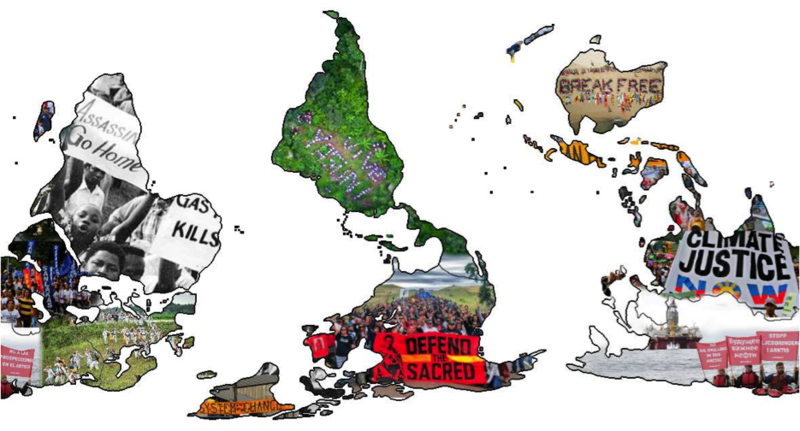 The Blockadia Map serves as a tool for activists to unite their struggles and build a stronger movement against the multitude of injustices presented by fossil fuel projects. When we come together in acts of defiance, our struggles become part of a bigger movement. Just as these resistances are real spaces where people and causes are connected, the Blockadia Map is a space for movement-building and international solidarity. Besides getting an overview of all the different kinds of resistances and direct action all over the world, the Blockadia Map also highlight the spatial mal-distribution of climate change sources and its impacts. Explore the Blockadia Map with the extra features of 'Fossil Fuels Extraction pr. Capita', 'Climate Change Vulnerability' and 'CO2 Emissions pr. Capita', click on the vectors to get additional data on each country. The Blockadia Map is an ongoing project, and the team welcomes new cases. Get in touch at [email protected]. The Blockadia team is co-ordinated by Alice Owen and Daria Rivin, Student Researchers at Lund University/ICTA-UAB, and Ende Gelände activists. The research team also consists of Andrea Cardoso of Universidad del Magdalena, Colombia, and Brototi Roy and Daniela del Bene, PhD candidates at the Institute of Environmental Science and Technology, Universitat Autònoma de Barcelona. The Blockadia Map is part of the EnvJustice Project http://www.envjustice.org/. Resistance: As a result of the Archuar and Shuar indigenous strong opposition, the block 24 was declared under state of emergency in 2001. In 2008, all the concessions (blocks 7, 21, 23, 24) from the oil company Burlington were expropriated by the Ecuadorian government. EJO's: Accion Ecologica, Pachamama, CDES, Amazonwatch (US), Friends of the Earth (US), CEOLS- Central Ecuatoriana de Organizaciones Sindicales Libres. Resistance: Over 40,000 people including students, women and the unemployed took part in protests and occupations against fracking. Some lasted over 5 months despite brutal repression. They called for energy democracy rather than groundwater contmination and corrupt politics. Resistance: Local grassroots coalitions protested the new pipeline by blockading the offices of the energy company, and landowners attempted to block surveyors from entering their property. They were concerned about oil spills and accidents as well as the climate, and called to "Put People Over Pipelines". Resistance: The construction delayed due to four years of community protest and opposition to the project’s development. In May 2016 about 3,500 people staged a protest in the capital. Organized by environmental groups, the protest began in front of the Japanese Embassy, where the participants demanded that Japan drop the 2,000-megawatt project, before marching to the presidential palace. Greenpeace Indonesia said the power plant will pump 10.8 million tons of carbon into the atmosphere a year, as well as air pollutants including neurotoxins such as mercury that could bring deadly consequences to Indonesia's environmental and human health. Despite these serious impacts, opposition is repressed and some demonstrators have been jailed. Resistance: Ireland is not for Shale! Keep the frogs in and the frackers out! Belcoo campaigners oppose fracking exploration activities and government stops company's exploration activities. Resistance: An official “People’s Referendum” took place on the 29th Feb 2012, in which 90% of the Belizeans voted against offshore exploration and drilling. In 2013, Belize’s Supreme Court declared offshore drilling contracts issued by the Government of Belize in 2004 and 2007 invalid, because no Environmental Impact Assessment had been carried out. However, in 2015, the government of Belize reconsidered initiating offshore drilling although up to 2017 no new concession has been granted yet. Resistance: On May 8th 2016, anti-coal activists gathered at the port and Sandgate Bridge railway line as part of the global “Break Free from Fossil Fuels” actions, #BreakFree16. 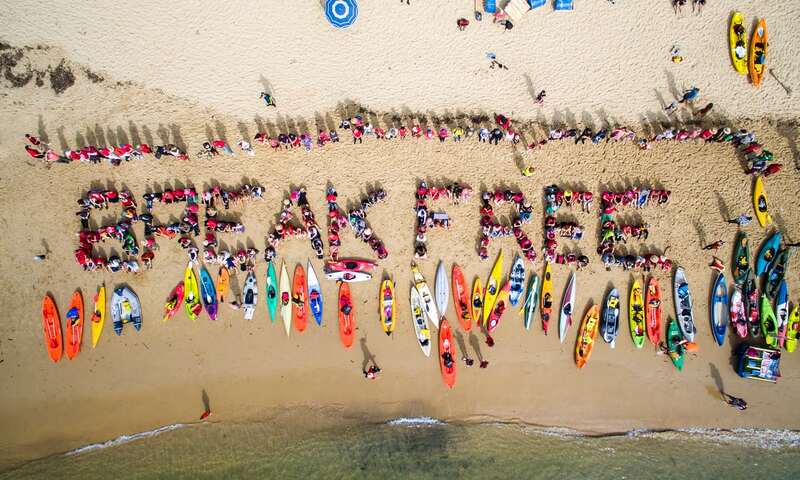 1,500 activists gathered in Newcastle and hundreds kayaked into the shipping channel to block coal ships from entering and leaving the harbour; while around 70 protesters at Sandgate Bridge blocked a coal train in a day of civil disobedience. Resistance: 8000 people marched for real climate leadership to avoid "climate chaos", in the biggest mobilisation against fracking in US history. Resistance: For the marginalised Saharawi people in Western Sahara, offshore drillng compromises their right to self-determination. To engage in street protests has become more and more dangerous, with arrests and police brutality. Resistance: Strong opposition to the largest coalmine project in Australia, from environmental groups and indigenous Wangan and Jagalingou People on the basis of climate change and impacts on the local and regional environment. Resistance: After several social mobilizations and the use of legal avenues, the project of the higher coal power plant in South America was stopped by the Supreme Court. This case is emblematic for several reasons, as the ruling prioritised the precautionary principle, making a decision before damage could be caused by the industry, and deciding for the first time in favour of the constitutional right to live in an environment free of pollution. Companies: Brazilian-germany joint venture, Chilean subsidiaries, For the thermal power station - CGX Castilla Generación S.A., For the maritime port - OMX Operaciones Maritimas Ltda. Resistance: To secure gas provision to Europe, Spain is becoming the gate of natural gaz from Northern Africa. Megaprojects, financiarization of infrastructure, energy oligopoly, environmental impacts and impunity for the damages created are some of the ingredients of this gaz storage facility. Since February 2010, the Plataforma en Defensa de les Terres del Sénia denounced before the EC the Castor project because no Environmental Impact Assessment had been made to assess the environmental implications of the project. Other groups in Spain joint the platform in denouncing the plant and in working for a different energy model. Resistance: Plans of private and public private companies for new coal plants in Greece have been abandoned thanks to citizens' mobilization and strong advocacy for alternative sources of energy and power saving measures. Resistance: The anti-coal march of 2016 highlighted a national campaign called “Piglas Batangas! Piglas Pilipinas!” symbolized by the struggle against the proposed 600-megawatt coal plant of JG Summit Holdings in Barangay (Village) Pinamucan Ibaba, Batangas City. The opposition to the plan is led by the Lipa Archdiocesan Ministry on Environment, local fisherfolk, and other concerned citizens. Resistance: In a country where the majority of coal projects are owned by big businesses and influencial people who have connections in the government, protesters and local defenders face violence and even death for standing up for climate justice, as was the case for Gloria Capitan, the 57 year old activist, and one of the leaders of the Coal-Free Bataan Movement. Resistance: The community group "Save Lamu" and their international supporters have been mobilising against the opening of a new coal power plant, which still remains to be constructed. The Lamu case has also become part of the growing nationwide "deCOALanize Kenya" movement. Resistance: 10,000 people joined the camp at Standing Rock to defend the ancestral land of the Sioux from the Dakota Access Pipeline. Supporters were diverse, including US Army veterans and Indigenous groups historically enemies of the Sioux Nation as well as environmental activists. Around the world activists also held street demonstrations and actions in solidarity with Standing Rock, calling to"Honor the Treaties", "Defend the Sacred" and recognise "Mni Wiconi, Water is Life" alongside the climatic implications of fossil fuels. Resistance: Part of the wave of "Idle No More" Indigenous activism, members of Elsipogtog First Nation and other activists held a three month blockade near a highway junction to symbolise a new boundary for fracking. Resistance: Activists occupy coal harbor for 30 hours two years in a row: creating awareness about the fossil fuel industry both locally and globally, fighting for “System Change, Not Climate Change”. Resistance: Acción popular frena el proyecto de extracción de petróleo en la Reserva de la Biósfera Seaflower. Triunfo de la protección de los derechos colectivos, a la solidaridad intergeneracional y a la riqueza natural y cultural. EJO's: Corpohumadea , CENSAT Agua Viva, Humanidad Vigente. Resistance: "Frack Off! 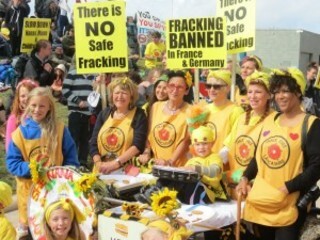 ": After immense social pressure and direct action against fracking, the energy company, Cuadrilla withdrew their application to extend drilling and horizontal well testing at a site near Balcombe in England. Resistance: Las organizaciones sociales y la comunidad de Casanare denuncian que la explotación de petróleo y el cambio climático son los causantes de la dura sequía que ha acabado con alrededor de 20.000 animales. Resistance: Over 300 protesters entered UK’s biggest opencast coal mine, Ffos-y-Fran to temporarily halt operations. The activists demand to Reclaim the Power, End Coal Now and transition away from fossil fuels by “leaving the coal in the hole”! Resistance: In 2014, organized citizens detained four trucks carrying equipment for the 2D seismic survey in the Piedra Sola and Salto concessions. The local police purportedly attacked them and some were arrested. Despite this, organized groups denounced the usage of dangerous chemicals by Petrel-Schuepbach and accused Uruguay’s environmental bureau (DINAMA) of authorizing drilling activities without conducting adequate hearing procedures. Thanks to citizens raising their concerns, so far, both local and national awareness brought up by these groups has sparkled a chain of bans on fracking by local municipalities in the Argentinian side of the border. The Entre Ríos province has also sanctioned a Law prohibiting unconventional exploitation of oil and gas. The Uruguayan government has also agreed to a moratorium on fracking, albeit activists aren’t willing to accept anything less than a ban on the procedure. Resistance: New Pipelines Threaten Intact Amazon Rainforests in Brazil. The 670km long pipeline between Urucu and Manaus fuels the industrialization of the Amazon and its transformation into a field for fossil fuels drilling, while the pipeline from Urucu to Porto Velho pushes further the rainforest frontier. Resistance: ¡Paremos la Mina! Las comunidades indígenas Wayúu, afro y campesinas de La Guajira en Colombia hacen un llamado URGENTE a la comunidad nacional e internacional para FRENAR EL PLAN DE EXPANSIÓN MINERA DE EL CERREJÓN, una de las minas de carbón a cielo abierto más grandes del mundo. Resistance: Workers and environmentalists ally to oppose prospections and deep shore drilling by oil giants Chevron, Statoil and Shell. They reject use of national resources for private profits. Resistance: After the approval of the plant, around 10,000 residents of the Chinese Hainan province organized a protest in Ledong county against the construction of the coal-fired power plant. They arrived for the opening event held to kickstart the construction work of the plant on 12 March 2012 and also closed their local shops and businesses to protest the construction. Protests lasted several days. Local residents were concerned that the potential sea pollution caused by such a plant could affect their fishing stocks and farmland. Clashes occurred between riot police and protesters.The Hong Kong-based human rights group, Information Centre for Human Rights and Democracy, stated that 50 people had been arrested and almost 100 injured during the protests. Resistance: Local farmers and diverse South African citizens are concerned about the impacts of fracking on their lands and the climate, and have organisd street demonstrations. This is is part of a large and ongoing public debate about fracking. Resistance: Collaborate resistance and mobilisation between Italy and Switzerland against project to build coal-fire power plant. Activists want “a future without coal”! Resistance: Las comunidades Achar y Shuar piden nulidad de los Lotes petroleros Nº 64, 166 y 196 que, en conjunto, se superponen al 100% de su territorio, y de todos los actos realizados por el Estado o terceros que establecen lotes petroleros, pues no fueron consultados, no cuentan con el consentimiento previo, libre e informado y van en contra de su Plan de Vida. EJO's: Organización Shuar del Morona (OSHDEM), Federación Shapra del Morona (FESHAM), Asociación Indígena del Morona (AIM), Achuarti Iruntramu (ATI), Organización Achuar Chayat (ORACH), Coordinadora Regional de Pueblos Indígenas (CORPI), Federación Achuar del Morona (FASAM), Federación de Nacionalidades Achuar del Perú (FENAP). Resistance: Preventing gas flaring has been supported as a "Clean Development Mechanism", causing those locally and internationally to protest as this does not go far enough in stopping the local and global devastation caused by oil drilling in the Niger delta, and does not meet demands of Climate Justice. Resistance: The town of Horní Jiřetín became a stronghold of the resistance to the plans of extension of the Czechoslovak Army mine. Together with villagers from several places, civil society groups organized referenda and a broad coalition called Limity jsme my - We are the limits. The movement networked with international climate justice movement. In June 2017 it organized the first Czech international climate camp in Horní Jiřetín. 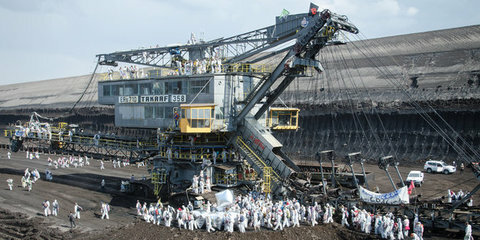 During the climate camp participants entered the coal mine Bílina and thus blocked the operations for a day. Resistance: Several years in a row activists as many as up to 6000 have organised themselves in the massive direct action against lignite mining in Germany, entering and blockading several coal mines. People coming together from all over the world for the Ende Gelände movement, demanding that we “Break Free from Fossil Fuels”. EJO's: Ende Gelände. “Break Free from Fossil Fuels”. 350.org. Rosa Luxemburg Stiftung. Resistance: For five years, activists have fought for climate justice by occupying and building tree houses in the Hambach forest, which the energy company, RWE wants to tear down so that the brown opencast coal mine can be expanded. Resistance: “Stop the Drill” - Campaigners set up a permanent protest site at Woodburn Forest to stop the company InfraStrata from starting to drill for oil and gas. Now the exploratory drilling has stopped. Resistance: Moblisation of various different social actors to stop the oil drilling activities in the Calilegua National Park. In spite of their opposition and against the envrionmental laws in force, the oil drilling license has been extended. Resistance: Comunidades rechazamos las concesiones para exploración y explotación minera de carbón antracita en el Páramo el Almorzadero, exigen el respeto por la lucha y resistencia que han librado durante años. Insisten en la conservación y preservación del páramo y en que los mantos de carbón antracita queden en reserva vital para la sustentabilidad de la vida de la Madre Tierra. Resistance: The Brazilian Society for the Progress of Science (SBPC), CIMI (Indigenous Missionary Council) and anti-fracking movements such as COESUS (No-Fracking in Brazil Coalition) are among those agents that started the mobilization against the exploration in the region.Thanks to the outcries of organized society, the suspension of shale gas exploration by use of fracking at the Vale do Juruá region still holds today. The possible application of hydraulic fracking caused even more concern due to the uncertainties and great environmental risks involved in the activity. Resistance: Gas exploration by Pluspetrol led to complaints by local people and to police repression with several deaths in February 2015. Project stopped for the time being. Resistance: En 2016 se iniciarán tareas de exploración en varios parques protegidos de Bolivia, entre ellos Pilón Lajas, sin embargo, la Confederación de Pueblos Indígenas de Bolivia (Cidob) ha anunciado su rechazo a estas actividades de exploración y ha advertido de que los habitantes de estas áreas protegidas opondrán resistencia. Resistance: Greenpeace activists managed to interrupt a major Arctic oil operation by climbing onto the Prirazlomnaya oil platform and by doing so, bringing their message across to the whole world to #SavetheArctic. 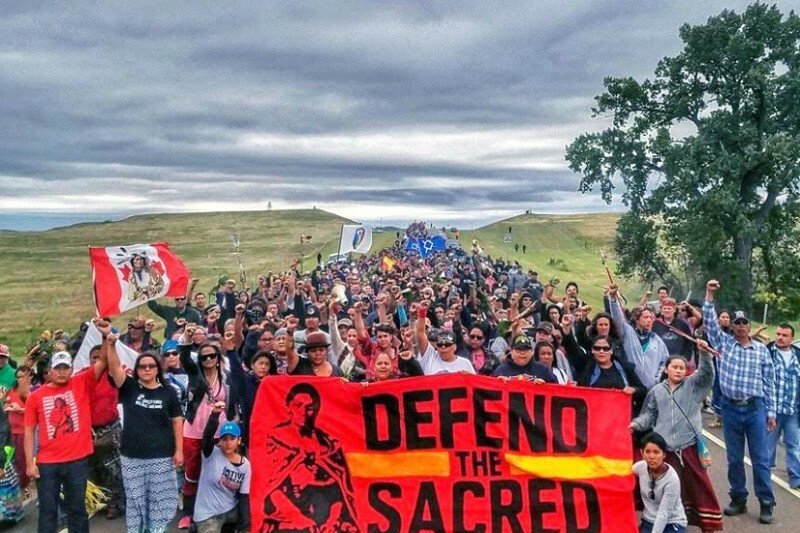 Resistance: A long-drawn struggle, which initially was about land aquisition and tribal rights, has now turned into a fight for climate justice. Resistance: No to fracking, not here, not anywhere, not now, not ever! Even the local concerns are focused on water and environmental impacts the actions of the Alianza Mexicana contra el Fracking are connecting the impacts of francking with the concerns of climate warming due to the leaks of methane produced during its extraction. These emissions can reach 8% of the total production of shale gas. Methane is a greenhouse gas with a potential warming of 86 times higher than CO2 in the short term. Resistance: Construction of 1320 MW proposed coal fired power plant by the Bangladesh India Friendship Power Company, a joint venture between Bangladesh and India, merely 14 km away from the ecologically sensitive Sundarbans forests has not only locals, but conservationaists and anti-coal activists all over the world united against it. There have been multiple mobilizations and protests across the world to prevent the construction of this plant. Resistance: In 2017, a new and broad coalition of climate activists called 'Code Rood' (Code Red) called for mass civil disobedience against the fossil fuel industry in the port of Amsterdam. A a climate camp was organised from 22 to 26 June and a mass civil disobedience action took place on June 24th. Some 300 people from the Netherlands, supported by groups coming from Belgium, Britain, Germany, France, Denmark and Sweden occupied Europe's second largest coal port, shutting down all operations for one day, making it the largest civil disobedience action in Dutch history. Resistance: Resistencia del Pueblo Mapuche contra el fraking “Se viene la destrucción para todos, pero nosotros vamos a defender el Wallmapu [territorio ancestral] por miles de años”. Con esta determinación, Elías Maripán, lonko -”autoridad”- de la Confederación Mapuche del Neuquén expresa la postura de un pueblo demasiado acostumbrado a resistir. Resistance: Greenpeace activists in the act of civil disobedience and direct action stops Chevron’s massive oil drilling ship by climbing onto it and swimming in front of it for several days, demanding that Chevron 'Go Beyond Oil'. Resistance: "Don't Frack with Our Water!" Tens of thousands of Algerians took part in protests across the country, calling for national dialogue and a halt to all shale gas operations. Resistance: At the very roots of Blockadia, The Ogoni people vs. 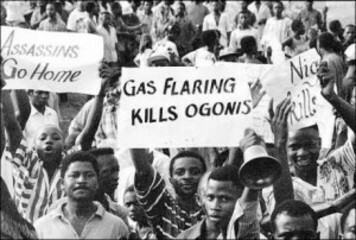 Shell is one of first cases of mass mobilisation to "keep the oil in the soil". Human rights violations and environmetal destruction caused mass mobilisation and international outcry. Decades later, justice has still not been served. Resistance: "You Shell Not Pass"! "Kayaktivists" formed a floating blockade to block Shell's drilling vessels, and environmental activists climbed aboard an oil rig to protest Shell's drilling in the Arctic. Street protests also brought together environmental and Indigenous activists in Washington State, in solidarity with the Indigenous peoples of Arctic Alaska. EJO's: Greenpeace. Inuit Circumpolar Council. Resistance: Pakistan is on its way to increase lignite mining, with 5 new power plants scheduled to start producing electricity by 2018, and many more in the pipeline. The Sindh Engro coal mining and power plant project in the Thar desert region of the country is a part of the China-Pakistan Economic Corridor (CPEC). The CPEC is a bilateral deal between the two countries under which the Chinese government and banks will financially support Chinese companies to build USD 45.6 billion worth of energy and infrastructure projects in Pakistan over the next six years. This deal is being criticized by climate justice activists for the impact it will have on global carbon dioxide emissions. Chinese companies and their partners are expected to spend around $15 billion over the next 15 years to build close to a dozen coal power plants of varying sizes around the country. EJO's: Islamabad Sustainable Development Policy Institute. Sindh National Front. Thar Sujag Saath, Thar Voice Forum. Villagers from affected villages. Resistance: Local activists occupied a senator's office to protest a pipeline for fracked gas and instead demanding a "fossil free" future. Resistance: After massive opposition from all over New Zealand, the Norwegian oil giant Statoil pulls its operations out of Northland. Local people and communities as well as indigenous Māori (NZ)- and indigenous Sami people from Norway came together to show the need to leave oil under the soil (and sea) to prevent global warming. Resistance: Oil exploration in Guarani indigenous territory without their consent, leading to a blockade of the road Santa Cruz - Camiri. 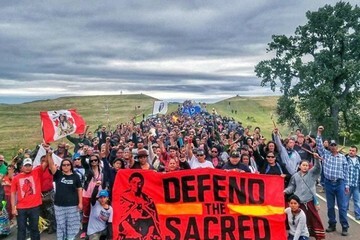 Resistance: With weeks of protest, large street demonstrations, blockades and an occupation camp, environmental groups and Indigenous peoples have come together to "Keep It In The ground", saying "We fight back! Protect climate, water, health: Stop Kinder Morgan". Resistance: ENEVA operates one of the largest natural gas-fuelled thermoelectric power generation complexes in Brazil. Local communities (such as "quebradeiras de coco") complain about pollution, health and environmental damage. Resistance: The Unistoten clan, alongside the Indigenous and environmental groups in solidarity, used direct action to mobilise against pipeline activity on ancestral lands. This included a road block and a blockade of their territory, and a camp. Companies: US Capital Energy, Inc.
Resistance: Desde 1995, los U'wa, un pueblo indígena del oriente de Colombia, se ha opuesto sistemáticamente a las explotaciones petroleras en su territorio. Resistance: Cancelled by the Correa government in 2013, the Yasuni initiative is still one of the most inspiring social proposal to step out from extractivism and a call for the whole world to "yasunize" our territories.